one of the new products! These new cards I’ve been working on are made with old band photos taken before I went digital. Most of the photos had some slight imperfection (the back of a head in a shot, not a great action shot, etc. ), but they look great sewn onto a card. I’m still thinking of a good name for them, but as for now I’m calling them band photograph cards, because I’m not feeling clever right now. I’m rather feeling like a zombie, having made 78 of these babies. I had an entire under the bed storage box filled with (mostly) band photos I’d taken. I really like combining photographs with bits of fabric or rick rack. This is one of the most enjoyable crafts I’ve done thus far. I also made a rather cool pillow, but I haven’t stuffed it yet. I’m just gearing up for Crafty Bastards! Reba Rar Rar Press and I leave on Thursday morning for DC. Wednesday night is The Lucksmiths at Schuba’s. Things feel like they’re on the up and up. I loves me a good moustache. Before hipsters started growing them because they were ironic, I still loved moustaches. At Renegade Craft Fair last weekend, I kept coming back to this since it’s such a fantastic idea. 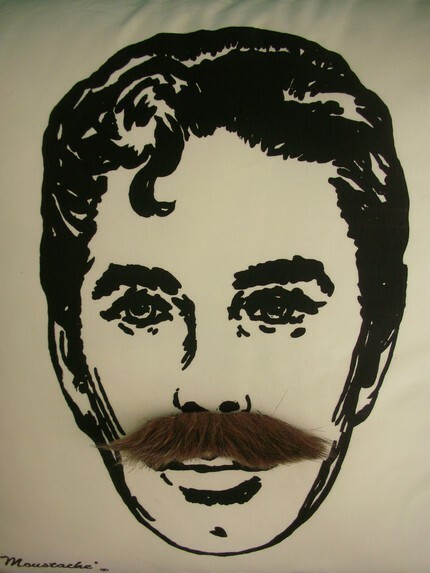 There was a company called Ladicakes in Chicago that made pillows shaped like their namesake’s moustache. The best was the Burt. That pillow was a big huggable thing. I just went to their former site and now it’s become some food blog. 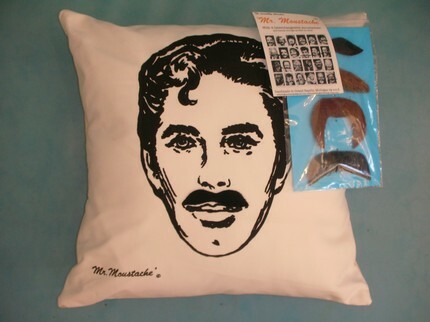 I think Ladicakes must have passed the torch to Sally England Design of Grand Rapids, Michigan, who makes this pillow with 4 interchangeable moustaches. Stella Yoon makes sweet artwork that would not be wrongly called (he)artwork. She has cards featuring the same character trying to tow a gigantic Christmas tree, making a snow angel, and trying to eat snow. 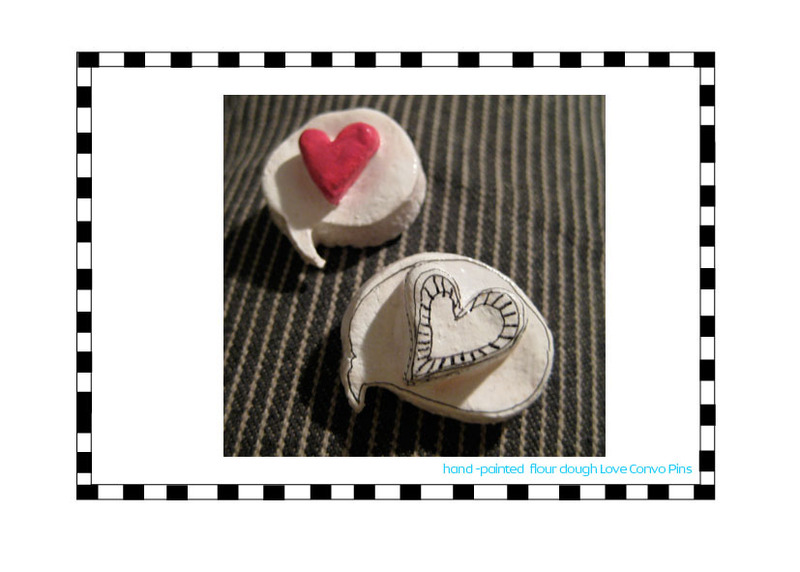 My favorite product that she was selling at her Renegade booth this weekend were her the hand-painted flour dough love convo pins. It’s a long name for a pretty simple, but very sweet product. The description of her company name pulled from her website perfectly summarizes her craft style: “Maeum is the Korean word for heart. There is a different word when referring to the physical heart and maeum’s usage is reserved for talking about the heart’s emotional state.” I ended up buying two of these, but I kind of want to keep them both for myself. The first day of Renegade Craft Fair (Chicago) was so excellent that on Sunday morning, I went to breakfast at Sweet Cakes (cupcakes are sort of sustenance) with friends staying with Zachary and me; Melissa of Dearest Inez/The Makery and her gf/bf friends Hillary of Beejeezus Zine and Will who runs Lebowski Fest. We saw them off to RCF and then I made 100 broccoli xmas cards in more traditional holiday colors. Also, I breathed some new life into a year old design. 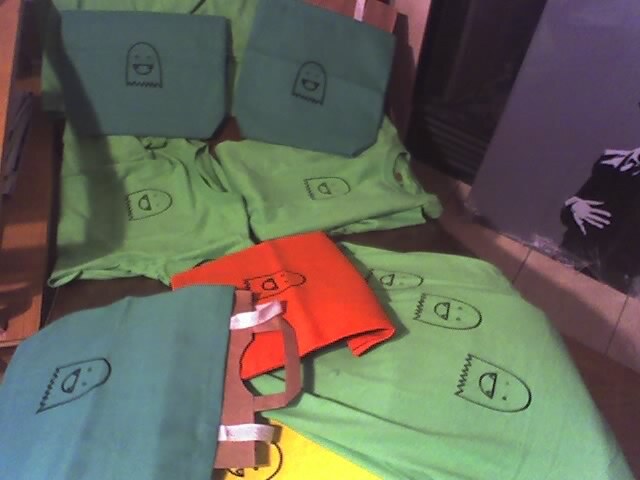 I used my cutie fanged ghost from the “you’re the best boo” cards and screened him onto tote bags to make trick or treat bags and onto shirts because they are cute as hell and remain one of my favorite creations. I’m pretty excited that I’ll have some stuff other than cards to sell at Crafty Bastards. Great news! I just received word that Rhymes with Twee got into DEPART-ment which is October 5, 6, and 7th! This calls for a celebratory cake! 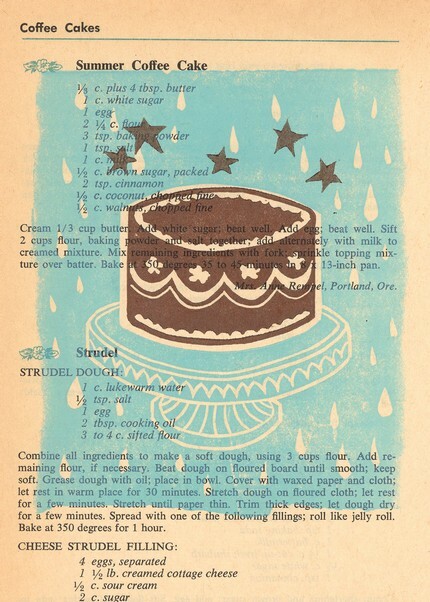 If you’re craving a delicious cake that will last a lot longer than the real thing, then perhaps this gorgeous linocut print will do the trick. I had another one of her prints marked as an Etsy favorite for awhile now, but this one really takes the cake (yeah, yeah, I know). Anyone who has spent a day with me knows my deep love for food. 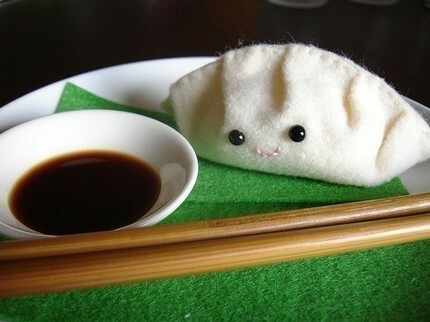 A good veggie gyoza is hard to find. Growing up in a suburb of DC, Alexandria, VA, my friends and I would often hang out at Springfield Mall. The food court there housed a great little yogurt place that now I’ve forgotten the name of. It was a chain restaurant that you’d find at most malls in the area, but the asian family who ran this place would make special veggie gyoza and sell them on the D/L. I’m not sure what happened; if they got in trouble for selling them, but all of a sudden, the gyoza were gone and they went back to only selling frozen yogurt. My heart pines for these delicious dumplings, but finding the happy little dumplings on Etsy by One Square Tree makes it hurt a little less. Buy one ($5) or save when you buy three ($12). These are the twee-est of the twee. In the craft world, there is a lot of overlap. Similar ideas are executed in different ways. I love going to craft fairs, but the repetitiveness can get a bit tedious at times. When I see something really unique, it’s pretty exciting. Scouring Etsy for earring storage, there were a couple of choices, but these blew the others out of the water. The two sister team behind P.S. 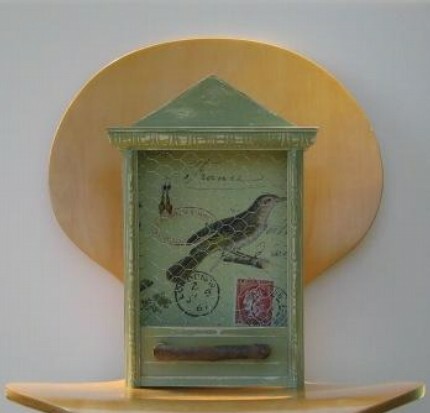 Original make truly functional works of art that remind me a lot of Joseph Cornell’s artwork. I love these are hangable and that some of their designs have little nubs you can hang necklaces from. I am ordinarily not a fan of shabby chic though that style works with this product.